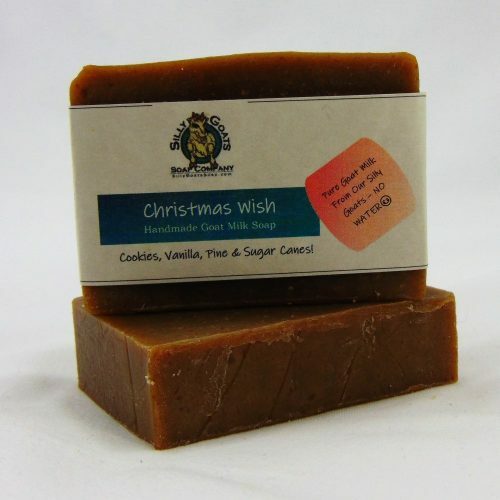 All the wonderfulness of our goats milk soap, plus Pine Tar! Pine Tar is an “old-timer” remedy for psoriasis. It has been used for over 100 years as a therapy for psoriasis and eczema. Pine tar is a dark vegetable liquid from pine trees that can be combined with goats milk to make a gentle, healing soap bar. 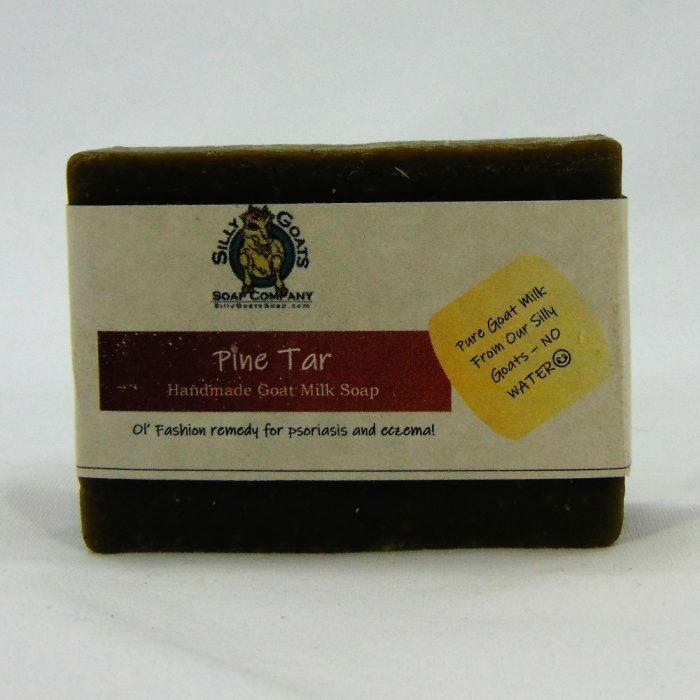 Pine tar soap is known for its therapeutic benefits for rashes such as psoriasis and eczema. It is also said to heal inflammations caused by poison ivy, poison sumac, sunburn and insect bites. It does have a very unique smell to it, but if you are one who suffers from skin conditions, it’s uniqueness would be appreciated! Pine Tar is known to be very conditioning and softening. It is a very earthy rustic scent. 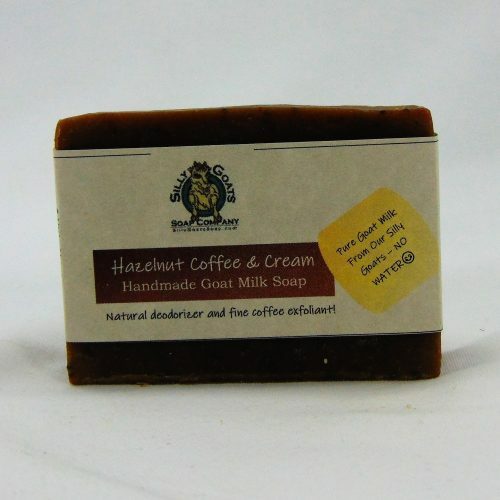 All our soaps are made with fresh goat milk from our herd of Silly Goats. 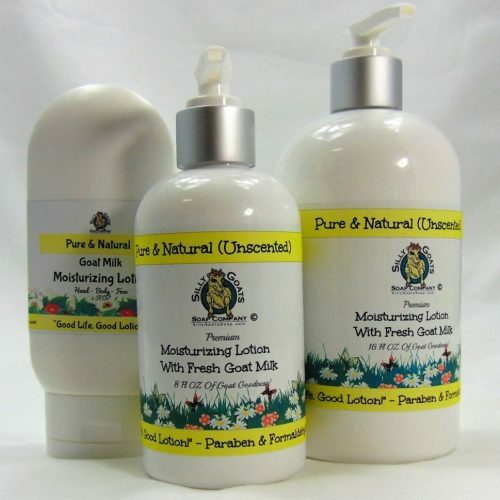 There is no water added, fresh, pure goat milk! Note: In a never ending quest to be more environmental friendly our soap wrappers are made with biodegradable paper and we also use a 100% biodegradable food-safe shrink wrap film called Biolefin. Protecting your products, preserving our planet! 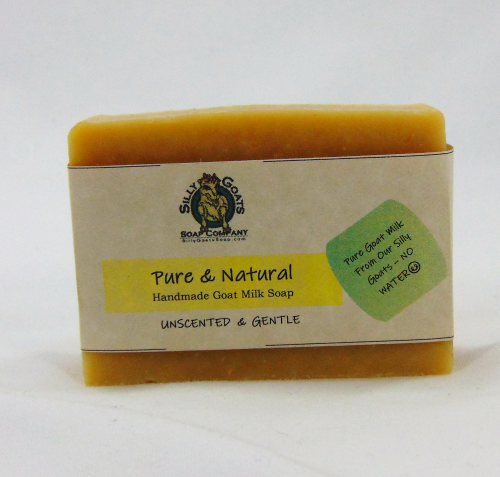 Ingredients: saponified olive oil, coconut oil & palm oil; goat milk, pine tar. The real deal! I’ve tried dr. squatch and legends creek. 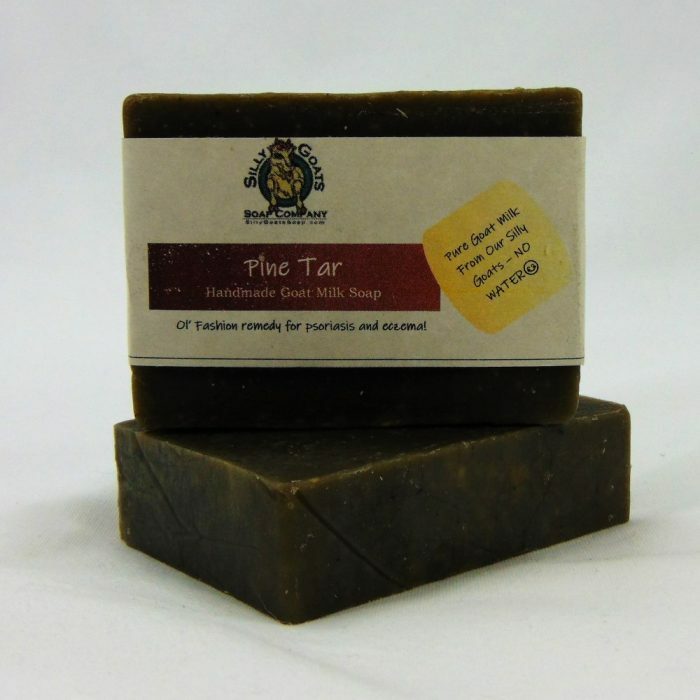 This Pine Tar soap is legit and real! I’ll keep coming back as it’s the only one that makes my skin feel better after using. 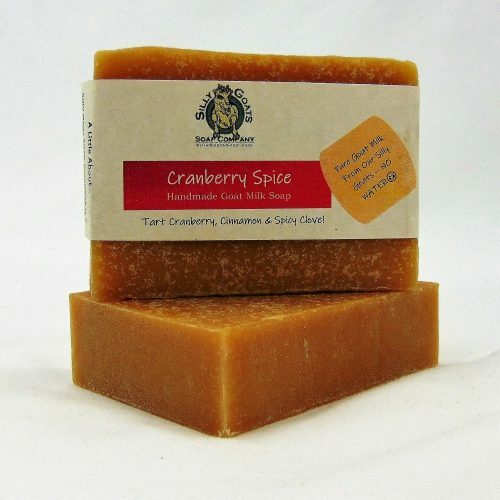 It leaves my skin moisturized better than any other specialty soap I’ve used. No more itching when I get out of the shower and the bumps on my arms are gone. Good job guys! The scent almost smells like root beer. Girl friendly. Love my soap! Great customer service and fast shipping! It’s great. Thanks so much! This is awesome Pine Tar soap! Thank You. As a girl, I love smelling sweet and girly. I have some skin issues and was told by my doctor to try pine tar soap. I heard that the scent was very masculine but out of necessity, I decided to finally try it. I am SO glad I chose this company because the scent is perfectly fine and I still feel girly. YAY!! This soap is awesome! I love it. I have only used for a week and am already seeing great results. Redness is going down and dry patches are decreasing. I am very hopeful! Love that I’m not itchy when I get out of the shower, all thanks to this soap. Only downfall is I’m three days into using it and it’s almost gone! Also, I can’t say it’s helped my skin problem (idk what i have, I’m waiting to see the derm), but it’s definitely helped my scalp and scaling on my scalp. Thanks so much! 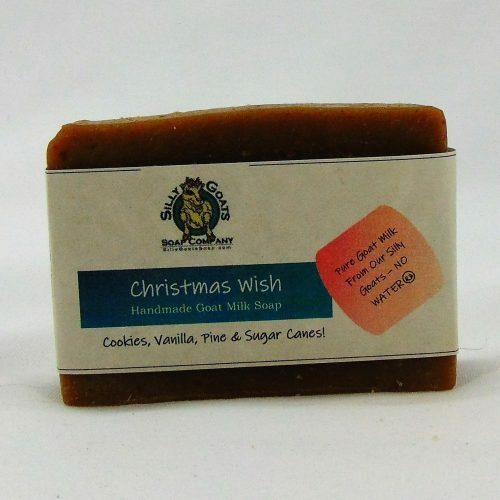 Great customer service, soap smells very nice, although haven’t used yet, I’m sure it will be well received as gift. Shop name fabulous? Fantastic product! Very fast shipping. Love this soap! 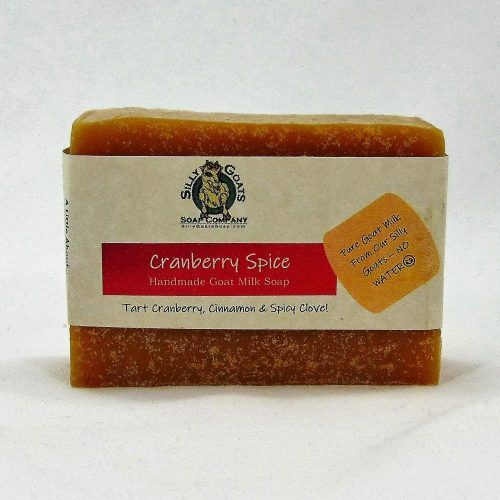 I have tried of ton of medicated soaps for my eczema and none of them worked. This soap works great! cleared up the break out on my hands and has stayed gone! recommended for those with te same skin conditions. Great soap! The smell is earthy and almost a bit smokey. I use the stuff head to toe and don't ever feel filmy residue like store-bought soaps. 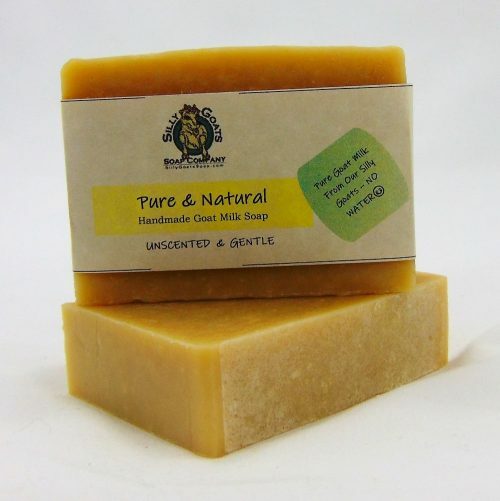 Between using this soap and drinking more water my normal dry skin issues are gone now. Thanks Silly Goats! 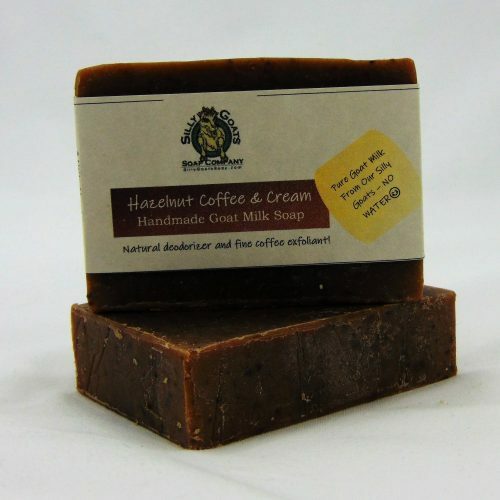 I'll try some of your other soaps here soon. Awesome, can’t wait to try this out and get rid of some dry skin! For all my fellow psoriasis sufferers out there. I know that some treatments work better for some people then others, but I have been getting great results using this pine tar soap. I am not going to lie it does have a piney, earthy scent to it. But unless I am going out on a night in town, I don't care as long as it is working. I am just looking for some healing and better looking skin. BTW, if I am going out on the town I use the Honey Oatmeal, smeels great and it is still healing my skin. Give these a try and try the natural lotions too!